If you have watched the 1986 blockbuster movie Alien, then you will easily identify with this particular slot. The movie directed by the famed director James Cameron was an instant hit amongst the masses and led to alien themes becoming a common phenomenon in Hollywood. Since the release of Aliens slot, there have been countless movies that have touched upon the topic of extra-terrestrial descending on planet earth with nefarious agendas. There has also been no shortage of alien-themed games in the gaming world. All in all, our fascination for aliens and extra-terrestrials certainly knows no bounds. Aliens free is a collaboration between 20th century fox and Netent in order to recreate the classic 1986 movie of the same name. 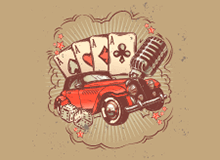 The slot was highly anticipated and awaited by the gambling community who were more than intrigued to how Netent had recreated or contributed to this classic movie. The game starts with an animated scene of a spaceship landing at LV-426. If you have watched the movie, you will come to know about Ellen Ripley who has set out from Weyland-Yutani Corporation along with some marines to investigate the claims of aliens killing the ship’s crew. This time she is back again but with a purpose to take vengeance from the aliens. The background of the game seems to be a screen which gives out electronic readings of different aliens. The sound score also feels quite enticing and goes very well with the theme of the title. 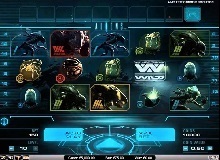 All the symbols in the game are extraterrestrial beings ranging from an egg, Weyland-Yutani Corporation to different aliens dominating the reels. The first level: Here, players have to look out for any sign of alien activity. You will need to collect different symbols and also fill up the activity meter with the biggest multipliers available within the title. Having big multipliers at your disposal with the activity meter helps you qualify for the second round. The second level: The second level is when the alien attacks start, and your goal here is to reach the queen hive which comes in the form of the third level. The multipliers that players managed in the first level are used as a symbol here. There is also an ammo clip reel containing ammo symbols. Landing one on the mid position will help boost the ammo clip counter. The third level: This is the last and final level within the title and provides you with the opportunity to kill the Queen hive and get 5 free spins as well. Managing this can earn you the prize reward of 1000 coins. 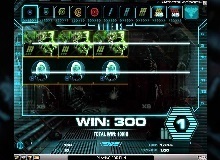 You can play Aliens slot machine online on a number of different devices like desktop, phone as well as tablets. Most of the phones today like Android, iOS, Windows and Blackberry phones all support this title. A good strategy to follow while playing Alien is to try and get all the symbols to overlay while you are on the second level. This could help provide you with big wins. The rules are fairly simple to follow here and there as such no cheats or ad hoc tips available to win the jackpots. Gamblers can play Aliens for real money as well as for free on a number of casinos online. Most casinos today offer a different kind of bonuses and credits to get players to sign up on their portals. 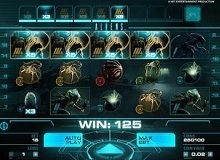 Aliens free combines the most immersive combination of arcade gaming as well as online slot technology in the slot. This is a must play for high rollers with potential for big payouts.